Microsoft Office XP Standard puts the features you need within easy reach at all times. New context-sensitive smart tags pop up with options you need--right when you need them. No more digging through menus. Tasks that once required multiple steps are just one click away with the new task pane. The new version of Outlook in Office XP Standard condenses all your personal and professional e-mail into one central location, even your Web-based e-mail accounts like Hotmail. With AutoRecover, your work is saved at regular intervals while you work. PowerPoint includes animation effects and custom slide transitions. An editable print preview assures that your printed slides and documents come out right the first time. 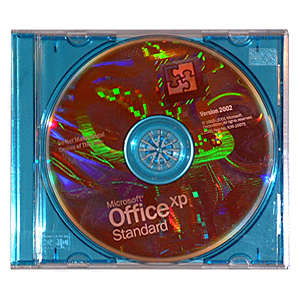 Office XP Standard also includes Word 2002 and Excel 2002!! Condition: New and Never Registered. One (1) Edge-to-Edge Hologram CD in Jewel Case. You must agree to the Terms and Conditions of the License Agreement in order to have a Valid License to use this Product! Includes the Full Versions of Word, Excel, Outlook, and PowerPoint! An additional 115 MB is required on the hard disk where the operating system is installed. Users without Windows XP, Windows 2000, Windows Me, or Office 2000 Service Release 1 (SR-1) require an extra 50 MB of hard disk space for System Files Update.